Contixo Kids Tablet - Features & Layout. Our Contixo kids tablet has Bluetooth wireless feature and is compatible with other Bluetooth devices such as headphones, keyboards, speakers, and more. Connect a speaker, headphones, headset, keyboard, etc. wirelessly via Bluetooth connection. 8GB, Wi-Fi, 7in - White. Samsung Galaxy Kids Tab E Lite SM-T113. No other accessories included. LeapFrog Epic Academy Kids Educational WiFi Learning Tablet 16GB NEW School Fun! This android-based learning tablet includes exclusive full-access to LeapFrog Academy, the new learning subscription service from LeapFrog. The tablet is kid-safe right out of the box. 4.5 out of 5 stars - LeapFrog Epic Academy Kids Educational WiFi Learning Tablet 16GB NEW School Fun! 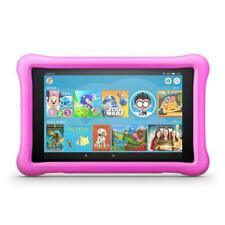 42 product ratings42 product ratings - LeapFrog Epic Academy Kids Educational WiFi Learning Tablet 16GB NEW School Fun! Moreover, parents can enjoy normal tablet mode through Standard Mode, so parents don’t need to buy their own tablet! Tablet is preowned and in excellent working condition. It was always kept on its case so there is no marks or scratches on the back. 2019 New version 7" Google Android Tablet 16GB Tablet PC for Kids Gift Game US. Quad core processor brings best experience for reading and watching. 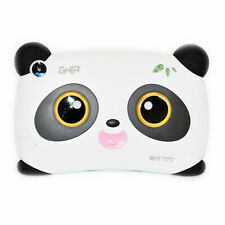 Processor: Up to 1.5GHz Allwinner A33 Quad Core. Tiny fingers can easily operate this tablet for the full-touch screen. Support Multiple Accounts If parents have more than one kids, don't worry. Support Android 4.4, coupled with the advanced Allwinner A33 CPU, gives this product great performances and better using experience. E. 7 ” Screen with 1024 600 Resolution: suitable screen with great resolution, you will find the image is more delicate and detailed,making the picture bright and vivid. Tablets for toddlers and other youngsters can be great tools for teaching or for when you want to provide them with some quick, easily accessible entertainment that is tailored to their level. 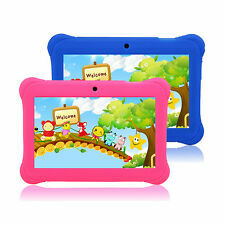 Children's tablets are available on eBay in a variety of colors, sizes, and styles. Understanding what specifications these items have or the features you can choose will help you find the device that meets your needs. What storage capacities can you choose? How can you connect a kids' tablet to the internet? Several models have internet connectivity. If you have a home Wi-Fi network, some kids' tablets with Wi-Fi will connect to the network you already use for your other devices. This option allows you to use the internet browser on the tablet from anywhere in the home. It's a great way to browse for fun, exciting, or educational content on the internet. If you would like to connect to the tablet to the online world when you're away from home, you can find models on eBay that include 3G support in addition to Wi-Fi. A 3G-capable tablet will connect to your cell network to give you internet access outside of Wi-Fi range. What features can you choose from? Built-in cameras - Many kids' tablets feature cameras in the front or rear of the device that you can use to snap photos or record video. Keyboards - Some tablets have keyboards as part of the frame or can accept connecting keyboards. Bluetooth - Tablets with Bluetooth capabilities can connect to other devices wirelessly.